I was quite delighted to be invited to the Car2Go press conference today in the Salt Building at what used to be the Olympic Village. There was a lot of press and tv in attendance – and the Vancouver Sun had a story this morning. Just to be extra careful, I must make clear that the programme is not launched yet – in the sense of being able to take out a car. They have opened registrations but the cars themselves will not be available until June 18. However it is worth pre-registering now – but you will have to read the rest to get the promo code. What makes this program different from the car share programs currently operating here (like Modo or zipcar) is that you do not have to return the car from where you got it. Like some of the new bike sharing programs, you can make one way trips. The car can be left at any designated spot in the business area, or any free on street legal in the residential area – including designated residential parking spaces. The special Smart cars are the only type available, but have advanced telematics so that they can be tracked and their location will be available to users when you have finished with it, and to the office to let them know when it needs attention. For that reason the “operating area” in the map appears to be very restrictive: the shore of the inlet to the north, south as far as 41st east to Nanaimo Street west to Dunbar. In fact you can take the car away from that – for instance for a trip to Stanley Park or UBC, you just cannot end the rental until you return to the operating area. 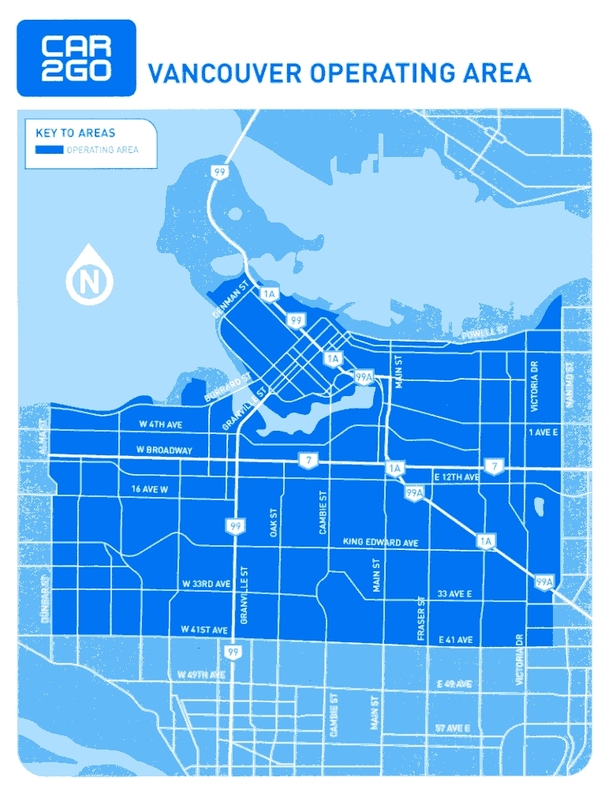 If you are not familiar with residential parking permit areas the City of Vancouver has a set of pdf maps showing the areas concerned. Modo The Car Co-op, Metro Vancouver’s premier and only local car sharing organization, is curious about how this method of transportation will work. Modo has been in operation since 1997 and as a founding member of the international Car Sharing Association, adheres to its Code of Ethics. As a transit-oriented car co-op, Modo prioritizes walking, cycling and public transit before the use of cars for transport. 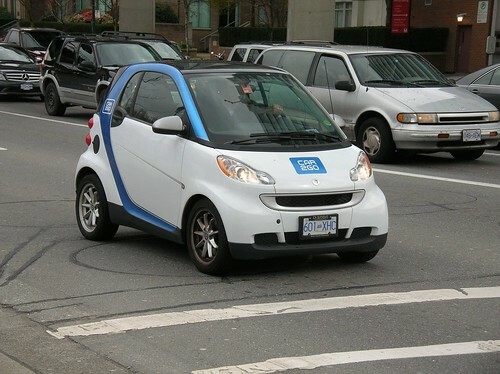 CAR2GO is perfectly suited for Vancouver. Daimler will open a fuel cell production facility in Vancouver [eventually the current internal combustion cars will be supplemented and probably replaced by electric cars]. These are the right answers in urban areas. The idea is innovative and successful. The idea came up in 2007 in Ulm where the first pilot phase of 50 cars was used by Daimler employees, who are the most demanding customers. Together with Austin there are now 35,000 regular members in the two cities. Vancouver is not just the first Canadian market, the company will be headquartered here and is proud to call Vancouver home. Car sharing is already working here. They will be opening with 225 low emission vehicles on June 18. 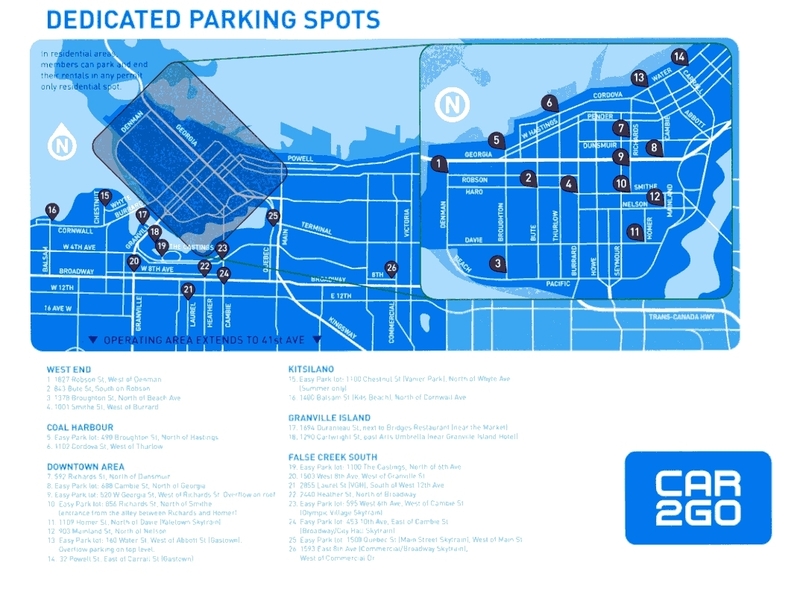 At present there is no registration fee on-line at www.car2govancouver.com or at the office 45 Water Street in Gastown. The Concept is based on the Smart Car that has been specifically designed for car sharing with a solar panel on the roof. It was sourced through the local Mercedes-Benz Canada retailers. It offers another easy and affordable option for the dense urban area: it is designed for the city and enhances bus and walk trips. It is part of the solution: an on demand alternative to vehicle ownership. It is available 24 hours a day, 7 days a week and may be used spontaneously or reserved 24 hours in advance. you may the use the key provided to start the car; there is no need to book the usage period. There is a discount for daily use, and no requirement to return the car – you can park it and hold on to the key if you want to. And users can always check their account on-line. He said that CAR2GO is part of the new movement to collaborative consumption – share and rent to reduce waste. He acknowledged support from City of Vancouver and said that last year’s test period showed that it would be a good fit here. There is a mandatory $2 fee for the special ICBC car sharing insurance but that they will donate that $2 fee for next 12 months to Canuck Place. They are also waiving the $35 membership fee for an introductory period (see below). said that the Salt Building was the “athletes living room” [It is to become a restaurant and this is the last event that will be allowed to used the building in its present form.] The city has the goal of becoming the greenest city and a full range of transportation options is essential to that. He also insists on maintaining the city’s livability. People in the city already walk, cycle and take transit in record numbers and were also early adopters of car sharing. There is a compelling environmental case in terms of the overall ecological footprint of car sharing. He said he was also excited to see that the company is to have its Canadian headquarters here, which fits with Vancouver’s desire to be at the centre of the global green economy. In answer to my question about the role of the telematics – it knows when it leaves the operating area – Mr Cole said that you are free to leave that area but you have to bring it back to end the rental period. He also said that “after we get operating we will look at the number of cars and the size of the operating area”. Christopher Gaze – Artistic Director of Bard on the Beach one of the users in last year’s trial here said “We had thought of getting another car. We now won’t.” In an interview with me later he clarified that: his household has no intention of giving up their Jag, but they would not need a second car now. He currently commutes from his home in Kits to the Bard on his bicycle. Mostly. I also spoke to Juliane Muehling, the Corporate Communications Manager for CAR2GO. She told me that Austin, Texas was quite different to Ulm – and Vancouver – but they were very keen to get the first American operation there, mainly due to the inadequacies of their transit system. They have had no problem with vandalism – as happens with the Velib bike share system in Paris. The cars stay in communication which means that they get fuel and servicing at need. 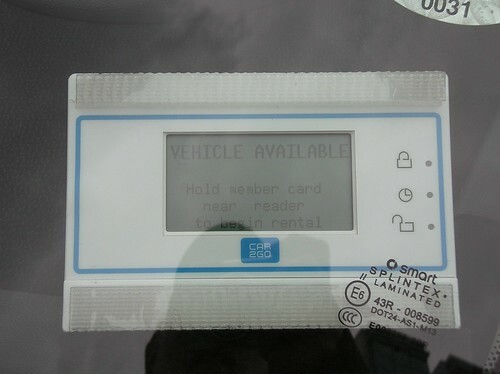 There is a fuelling card in the car: users may use to refill the tank – and if they do so get some free minutes on their rental. They intend to be a small company and use local vendors and services – for example Bashir Auto is doing the cleaning. The City concession on allowing parking in residential zones is common to all car shares not just CAR2GO. I did take the car on a short test drive and found the process to be easy. There are two videos on the web site if you feel you need more teaching. I was pleased to note that the radio is tuned to CBC Radio 2 by default – though that could change in response to user demands. The telematics system includes a hands free cell phone. You might also be interested to know that the system was developed with (W)right ON Communications wave front services: they are a federal government funded “wireless accelerator”, a non-profit designed to promote technology. If you decide to do so enter the promo code SUSTAINABLE and you will get free registration and 30 free minutes of drive time. Will Megabus kill High Speed Rail? 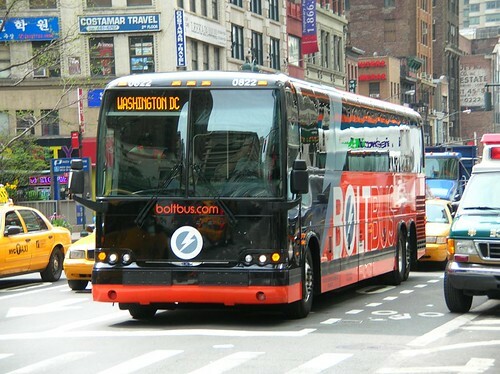 The slightly longer answer is that while new, innovative bus services on some routes in the United States are winning new customers to long distance buses, they will pose little threat once there are true high speed railway services to compete with. They will probably be price competitive, but speed and service quality of the kind now enjoyed in France, Germany, Japan – and even across the English Channel will secure a much larger chunk of what is now airline travel. I was a bit taken aback by the tone of the Economist article until I realised that it was not a newspaper article in the Economist’s usual style but a blog post where “our correspondents inform and entertain business travellers with news, views and reviews that help them make the most of life on the road” . So not much analysis or data. Indeed there is not a great deal more in the Business Week article that inspired the blog post. Much of the recent success of the curbside business derives from its nimbleness. … the bus simply uses existing roads, requiring no policy debates, government funding, or land management studies. It needs only a curb and a sign. Bus companies are also able to gauge demand quickly, gather rider input online, then alter pickup locations or routes just by posting changes to their websites. … numerous requests on transit blogs for new service from Chicago to Memphis … A couple of weeks later he has the buses up and running. While Business Week compares that the uphill struggle that Obama is having trying to get his high speed rail legislation through Congress, I do not agree that this poses much of a threat to high speed rail – though it does make for snappy copy. And the advantages of high speed rail have been discussed on this blog often enough . So the thing that I really want to comment on is why we don’t see services like Bolt Bus and Megabus here. And the answer is the Passenger Transport Board. This really is a bit of an anachronism and it surprises me a little that it has survived the long run of the BC Liberals – especially with archconservative Kevin Falcon as Minister of Transport and of deregulation during that time. The PTB is the successor to the Motor Carrier Commission who I have also looked at a while ago. Then I was on about taxis but so far as I can see I have not said much about the inter city bus business. I have underlined what I see as the key phrase. What that means is the PTB continues the philosophy of the MCC – its purpose is to protect the established operators. There is no taxpayer subsidy for long distance buses as there is with transit. But there are equivalent challenges: basically the hope is that companies will cross subsidize low ridership routes to remote communities with the profits from better patronised services. Of course, those are the ones that attract other operators, who if allowed to “cream” the best business, will lower the profitability of the established operators and lead to cuts in service on the low profit routes. Actually it does not seem to be working like this either, since there is no way the Board can compel an operator to continue to provide an unprofitable service as the Island case I cited above shows. 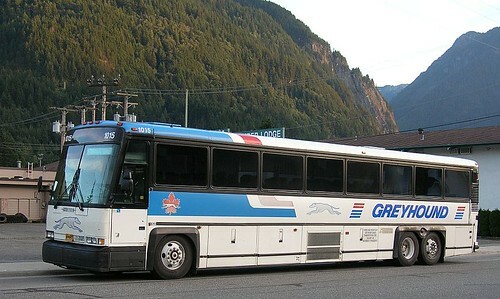 So given that we have a very poor level of intercity bus service in BC and many communities that would like better service, why has this regulator survived? I think apart from inertia, there must also be an understanding of the political power of those who currently hold licences. This is most obvious in the taxi business. Presumably, no-one important enough has ever wanted to get into our intercity bus market. It is simply not big enough to attract Stagecoach and the like. There have been innovators – the specialized services aimed at skiers to Whistler and surfers to Tofino testify to that. But we have yet to see anything significant to develop elsewhere. Yet I would bet that the same conditions that make for a good market in the US – high gas prices, rising air fares, slow lines at airport security checks – apply here. 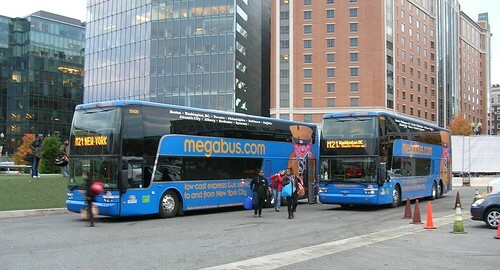 The key to MegaBus success has been its ability to adapt fares and schedules to demand. That is simply not possible here under PTB rules. If you believe the rhetoric of the market driven BC Liberals, then getting rid of the regulations – at least as far as services and prices are concerned (clearly safety must remain a paramount concern) would see all kinds of people who understand their local market getting into the intercity transportation business. And to the extent that cuts into the current need for many people to continue to own a car in case they need to make such a trip, that would actually be good for the environment. A well loaded bus is a pretty good way of reducing emissions per passenger kilometre travelled. There has actually been a steady increase in competition on some important routes like Vancouver – Victoria. The PCL bus still is first on, first off the ferry, but more people now use transit at each end – and walk on and off the ferry. 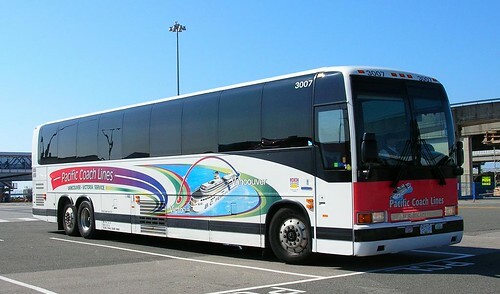 The Quick shuttle bus to Seattle now offers wifi – and, as the CBC recently noted, there are still lower costs flying from SeaTac than YVR. The Amtrak train service is also often a bus – you have to read that schedule carefully – and even when it is a train, it is very slow. We have to hope that the proposal for high speed rail on this route survives better than the one in Florida. Meanwhile, I would like to suggest that if we must keep regulation in place for intercity bus services, we do so in the public interest and not solely in the interests of the licensees. The Times Colonist has a story about alt fuels this morning – their headline adds ” with fraction of the emissions from gasoline”. Apparently it comes from renewable sources – but what exactly is not specified – and can be mixed with regular fuel and used in current engines without modification. So since they mention renewables that presumably means less net greenhouse gas emissions than a fossil fuel, which a Good Thing. And the route they have chosen to go avoids the major pitfalls of most alt fuels which require either modified engines or different fuel dispensing systems – and, frequently, both. Much will depend on price of course – and the, so far, mysterious source. There are many other toiling in this field – algae being popular and a better choice than grains otherwise used as food. Fortunately gasoline is going to continue to get more expensive – as the market is betting that way now too even though there are no actual shortages at present. So that means that even the big oil companies are starting to look around for ways to make what they have go further and last longer. But – yes there is always a but – the problem of the car is not just what you put in its tank. Indeed, I begin to think that is the least of our immediate concerns, since car dependency has brought so much misery in its wake. We were persuaded to drive everywhere and told this was the ultimate freedom only to find we had lost most of the other choices in the process, and become sick, lost many to collisions and seen the places where we live transformed into parking lots. The real choice now is we either ween ourselves off the automobile by creating walkable places – or we continue to pursue the impossible dream that we have never realized in the last sixty or more years. Alt fuels like this one may not actually help very much – because they allow us to continue with the illusion that auto mobility can be made sustainable. Yet it is clear that in places that have tried to make it possible to drive everywhere end up choking themselves on traffic. We know that when people have a choice, they will begin to turn away from cars and auto oriented places. Indeed some say that is already observable with the success of downtown Vancouver. The new urbanists are showing that there can be a wider variety of placemaking – it does not have to be high rises around subway stations. Though we always knew that worked because every major world city already had that – though many took a while before they realized that mixed land use in their central places was a Really Good Idea too. The cities that had the sense to hold to streetcars – or to put them back – found success too. As did the places that developed bike lanes and concentrated on pedestrian safety and places to people watch. Not exactly a complicated paradigm to get ahold of – but one which entrenched commercial interests are still doing their best to resist. 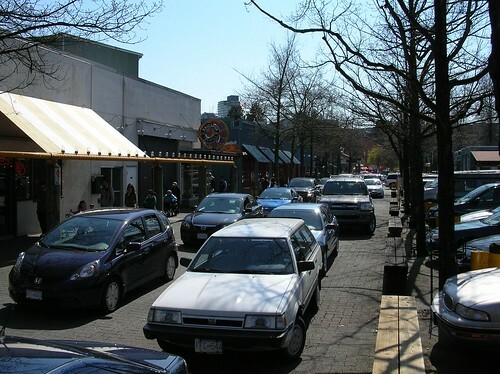 Suburbs are a challenge – but were commonplace long before widespread car ownership. Retrofits now underway across the US are starting to show what can work commercially as well as offer hope for a more sustainable future. For the record I want to re-iterate that while I know that we need to develop transit – and actually I think the more types of transit (local shuttles, bus, rapid bus, lrt, metro, commuter rail) the better – there will still be cars. New models of operation like car sharing and car pooling are developing – and there have been a few false starts. The velib/bixi model works with bikes – if someone picks up the tab for our bad behaviour – and will probably work better with car share schemes – I look forward to learning more about that next week. We already know that people who belong to car coops use transit and ride bikes more than those who own vehicles. That may say more about the demographic and location of early adopters. 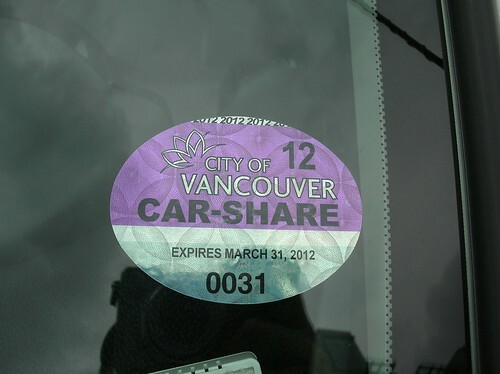 Car sharing is not yet main stream – and seems to be stuck in the city centres where there are plenty of other options already and any car use should be curtailed, if we are to avoid living in a place that works like Granville Island. It has train tracks but no trains. And the nearest transit service is nowhere near where people want to be. 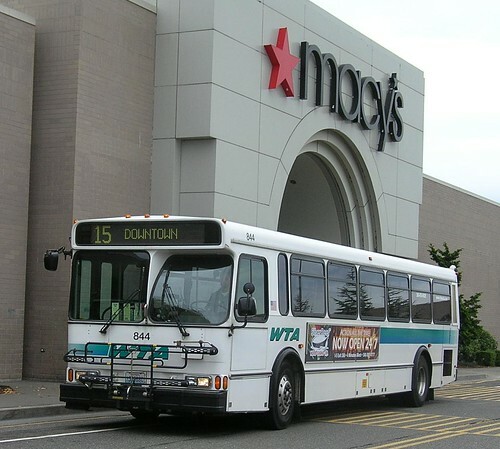 At the very least, the suburban American malls (like Bellingham) that put the bus stop at the building entrance – and not way out beyond the limits of the parking lot – show they know what has to be done. Vancouver, New Westminster, the City of North Vancouver seem to be determined to say “no more” to the car – they simply do not have the space. Surrey obviously wants to do something different now to what is has been doing and poor old Coquitlam and Port Moody have been desperate to get on the bandwagon but are stuck waiting for SkyTrain. Meanwhile highway #1 is being widened and the SFPR is taking over the bog and the farmland – protest today. I doubt the elite will even notice. Everywhere else is car oriented now and has little hope of anything more than marginal change when radical action is needed. We do not live in a society that embraces planning. We like to think that somehow the market sorts out optimum solutions. Nonsense of course, but one which still seems to attract the voters. We have been social engineering for years – and mostly for the benefit of a few large corporations, who did their best to persuade us that this was also good for us – even though it was always manifest that it was anything but. And I do not expect any of our governments to get any better at picking winners – or even make much effort when there is so much else to distract us. The present fleet of cars will be around for at least another twenty years – and the current short terms supply problems from Japan will doubtless be sorted out and provide a short window of opportunity for other, less skilled auto makers and sellers. The turnover rate for our built environment is even slower. I know it seems to be rapid but that is an illusion. We just tend to notice the new bits more. So two cheers for Novaera. And hope that a few more pols will notice how many people are looking for REAL change – and have not been voting very much recently. car2go is an innovative mobility solution redefining individual transportation in urban areas. A subsidiary of Daimler, it provides an innovative mode of “on-demand” transportation which compliments existing public transportation alternatives by bridging the gaps commonly associated with the “first and last mile” of a public transit commute. 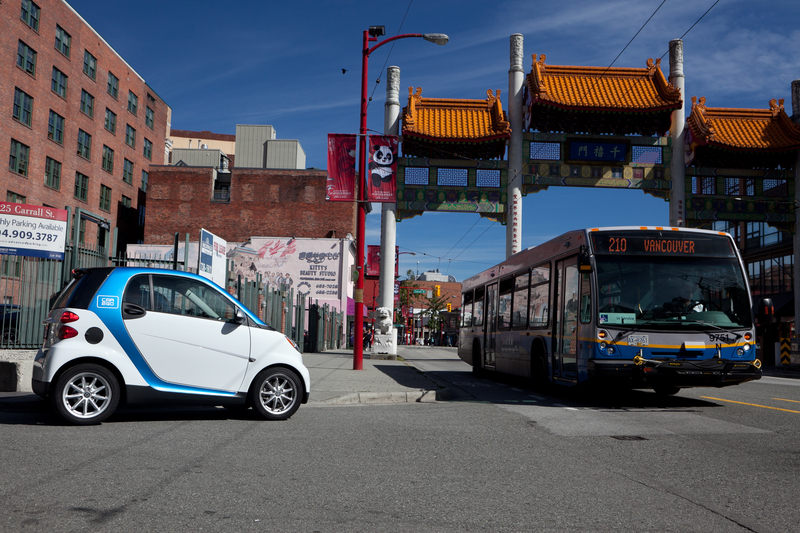 car2go offers an extensive fleet of environment-friendly smart “car2go edition” vehicles with solar roof for rent. Unlike traditional carsharing programs, car2go vehicles can be accessed “on-demand,” and members may use the vehicle for as long as they like, without committing to a specific location or time to return the vehicle. Charges are based on minutes used and include fuel, insurance, parking and maintenance. After launching the program in the city of Ulm, Germany as a pilot project in 2008, Austin, Texas was the first US city launched in November 2009 followed by the German city of Hamburg in April 2011. 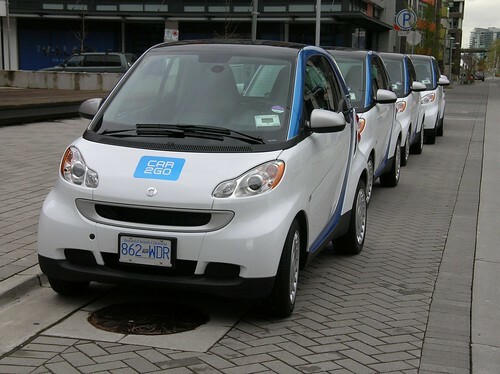 To date, car2go has reached more than 20.000 customers in Ulm and 15,000 registered members in Austin and is set to undergo significant expansion in North America in 2011. Seems like there is to be a new car sharing service in town – expect more as soon as I can get something on line on Wednesday. If only I had posted the picture when I had taken it I could have claimed a scoop. I beat wikipedia by a day in getting the image. I have been informed that there was a limited trial assessment running in Vancouver last year. Text of a Press Release copied below. This does seem important to me – even if it is not exactly about transport and planning in Greater Vancouver. I have left comments and pingbacks open so if people want to opine on this sort of thing getting posted here they can. If you are on the Landwatch list serve you will already have seen it, since I forwarded it there as well. Kudos to the Canadian Centre for Climate Modelling and Analysis in Victoria, BC. New York — April 21, 2011 — In a study to be published in the April 21st issue of Science magazine, researchers at Columbia University’s School of Engineering and Applied Science report their findings that the ozone hole, which is located over the South Pole, has affected the entire circulation of the Southern Hemisphere all the way to the equator. While previous work has shown that the ozone hole is changing the atmospheric flow in the high latitudes, the Columbia Engineering paper, “Impact of Polar Ozone Depletion on Subtropical Precipitation,” demonstrates that the ozone hole is able to influence the tropical circulation and increase rainfall at low latitudes in the Southern Hemisphere. This is the first time that ozone depletion, an upper atmospheric phenomenon confined to the polar regions, has been linked to climate change from the Pole to the equator. “It’s really amazing that the ozone hole, located so high up in the atmosphere over Antarctica, can have an impact all the way to the tropics and affect rainfall there — it’s just like a domino effect,” said Sarah Kang, Postdoctoral Research Scientist in Columbia Engineering’s Department of Applied Physics and Applied Mathematics and lead author of the paper. The ozone hole is now widely believed to have been the dominant agent of atmospheric circulation changes in the Southern Hemisphere in the last half century. This means, according to Polvani and Kang, that international agreements about mitigating climate change cannot be confined to dealing with carbon alone— ozone needs to be considered, too. “This could be a real game-changer,” Polvani added. Located in the Earth’s stratosphere, just above the troposphere (which begins on Earth’s surface), the ozone layer absorbs most of the Sun’s harmful ultraviolet rays. Over the last half-century, widespread use of manmade compounds, especially household and commercial aerosols containing chlorofluorocarbons (CFCs), has significantly and rapidly broken down the ozone layer, to a point where a hole in the Antarctic ozone layer was discovered in the mid 1980s. Thanks to the 1989 Montreal Protocol, now signed by 196 countries, global CFC production has been phased out. As a result, scientists have observed over the past decade that ozone depletion has largely halted and they now expect it to fully reverse, and the ozone hole to close by midcentury. But, as Polvani has said, “While the ozone hole has been considered as a solved problem, we’re now finding it has caused a great deal of the climate change that’s been observed.” So, even though CFCs are no longer being added to the atmosphere, and the ozone layer will recover in the coming decades, the closing of the ozone hole will have a considerable impact on climate. This shows that through international treaties such as the Montreal Protocol, which has been called the single most successful international agreement to date, human beings are able to make changes to the climate system. Together with colleagues at the Canadian Centre for Climate Modelling and Analysis in Victoria, BC, Kang and Polvani used two different state-of-the-art climate models to show the ozone hole effect. They first calculated the atmospheric changes in the models produced by creating an ozone hole. They then compared these changes with the ones that have been observed in the last few decades: the close agreement between the models and the observations shows that ozone has likely been responsible for the observed changes in the Southern Hemisphere. This important new finding was made possible by the international collaboration of the Columbia University scientists with Canadian colleagues. Model results pertaining to rainfall are notoriously difficult to calculate with climate models, and a single model is usually not sufficient to establish credible results. By joining hands and comparing results from two independent models, the scientists obtained solid results. This study was funded by a grant from the National Science Foundation. 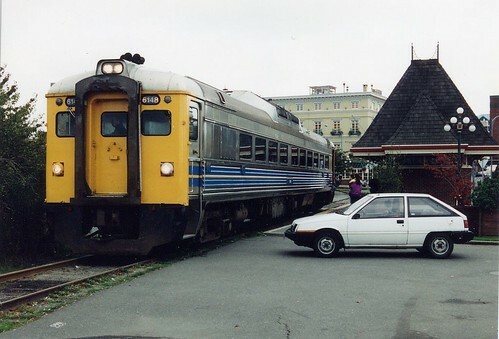 The Globe and Mail sets out the depressing recent history of the Esquimault and Nanaimo Railway. I have, of course, covered this before – with the same photo! 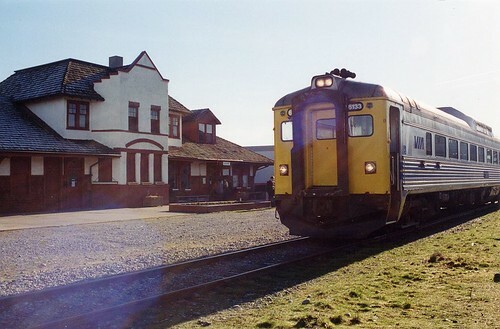 I came to Vancouver Island in 1994, when I worked for the BC government. The railway was, of course, an issue then. That really has not changed very much except, like the railway, the position has steadily deteriorated. In fact one of the last things I did before I left was buy myself a round trip ticket for the ride from Victoria up to Courtney and the back again. I was pretty sure I would not have the opportunity again – and at present it cannot be done. The once a day train has stopped running – and in fact has not been allowed into Victoria for a while. 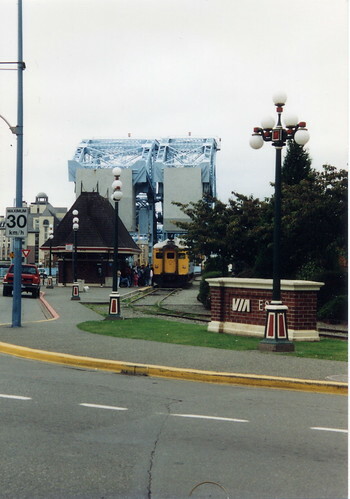 While I lived in Victoria there was a lot of interest in running a train into Victoria in the morning and out again in the evening – just like West Coast Express. That, it was said, would give people an alternative to the “Colwood Crawl”. Unfortunately the government of the day was committed to the Island Highway – an idea born of the previous SoCred government. Nanaimo being a centre of NDP support – and of course the bingo scandal – they wanted the highway much more than any upgrade to the E&N. On that last ride in 1997 I got see the raw wound of the new highway carved across the scenery. At one time the E&N was one of the more scenic railway rides. It seemed to me at the time that the Island Highway project had damaged much of that. 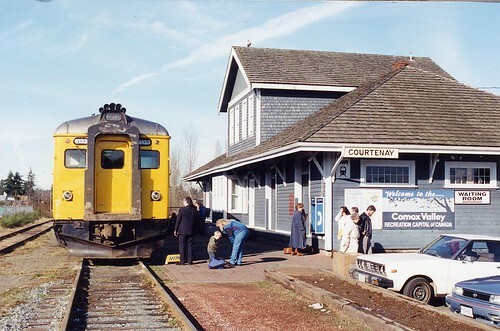 Once you got to Courtenay there was really nothing much to see – and anyway the single car train simply reversed direction and went back the way it came. There was no catering on the train. A coffee truck came out to meet it at Nanaimo – and there was time to get a cup of something very like coffee and some thing else which was almost edible. 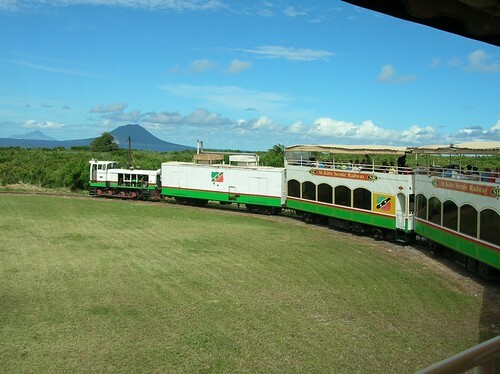 This is also an idea that was adopted on St Kitts with their narrow gauge round the Island line left redundant by the abandonment of sugar growing. They of course now have tourism as their only industry – so their minds were much more concentrated. But enthusiasts in many countries have started successful railway preservation projects – perhaps none more so than in Great Britain where Dr Beeching provided them with plenty of opportunities, and there was a considerable body of enthusiasts and experienced, retired railwaymen. Some of these operations quickly expanded beyond the gricer and Thomas the tank engine markets into real transport service – and are now known as “community railways”, with the opportunity for government support for socially necessary services. Victoria is, of course, a cruise ship port of call. You cannot expect the cruise ship companies to come up with excursions themselves but everywhere that cruise ships operate there are small tour operators keen to tap the deep pockets of cruise ship passengers. 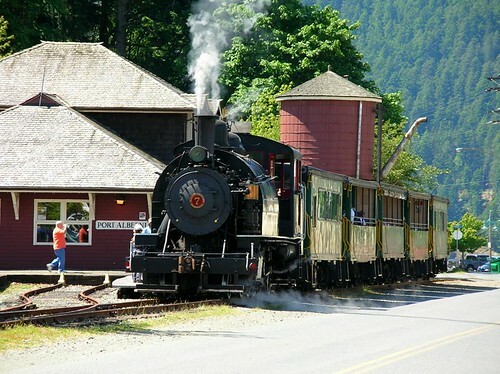 Alaska, for instance – and the Yukon – both offer train rides to them. BC has one of the best tourist railway operators since VIA gave up on the finest scenic passenger ride – the Kicking Horse pass to Banff – which has allowed Rocky Mountaineer to become very successful indeed and expand with services to Whistler and beyond. If we had governments who could get the heads out of highways for a moment, they would see that the lower end of the E&N could become very useful both for moving commuters and tourists. Indeed this market segmentation strategy is essential. Virgin brought that expertise to British railways from its airline business and has doubled passenger traffic on its route (the West Coast Main Line). Running trains for people is a different kind of business to running trains for freight but unfortunately North American railways are dominated by those who understand freight alone. It is not beyond the wit of man to come up with a structure that would allow for different types of train service that will attract commuters and tourists – just not at the same time. And freight trains could be fitted in between them, even without huge investments in signalling. As Bombardier was saying, the time is right for trains: if only because they are far more fuel efficient per passenger kilometre than most other modes. In 2010, the rapid transit alignment was approved and endorsed by all directly‐affected municipalities (Victoria, Saanich, View Royal, Colwood and Langford), the Victoria Regional Transit Commission and approved by the Board of Directors. 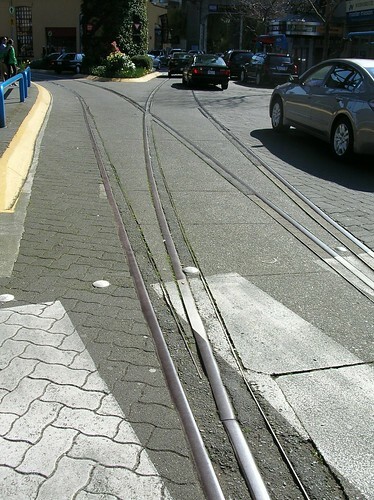 The alignment follows Douglas Street between downtown Victoria and Uptown in Saanich, then runs parallel to the Trans‐Canada Highway and the Galloping Goose Trail to 6 Mile/Colwood Interchange, along the Island Highway to Colwood City Centre, then into Station Avenue in Langford via Goldstream Avenue. 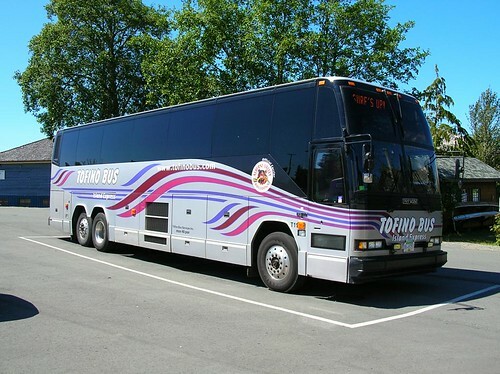 In May 2011, the business case with the recommended technology will be submitted to the Victoria Regional Transit Commission for endorsement and then to the BC Transit Board of Directors for approval in May. If approved, the business case will be submitted to the Province of BC in June. The timeline for the project will be finalized once BC Transit receives approval and funding for the project. The cost of the preferred technology along the entire alignment is estimated at $950 million. Not a press release – but an article posted by my friend Eric Doherty, a colleague from the Livable Region Coalition. The report in question can be downloaded as a pdf from The Canadian Centre for Policy Alternatives – and there is also a summary pdf and will be a slide show later. I did not get advanced notice so I have not yet had time to read the report – or even the summary and I am bit occupied at present. However I feel quite confident that any report co-authored by Eric, Patrick Condon, Kari Dow, Marc Lee and Gordon Price will be worth your time. This study lays out a plan for a 30-year initiative that would transform the ways in which people and goods move across our province. This in turn will create complete communities with affordable housing choices, more and better jobs, and a better quality of life for all British Columbians. 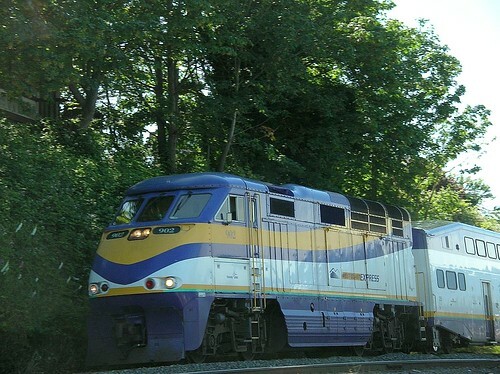 (Vancouver) Aggressive investments in BC’s transportation system will not only reduce BC’s greenhouse gas emissions, but lead to healthier, safer communities for all British Columbians, according to a new study. The study, co-published by the Canadian Centre for Policy Alternatives and the Wilderness Committee, sets out key strategies for urban, suburban and rural areas that will improve transportation and quality of life at the same time. “Instead of allocating billions of precious tax dollars on wider roads and bigger bridges, like we’re doing now, we need to build a province-wide zero-carbon public transportation system,” says co-author Patrick Condon, UBC chair in Landscape and Livable Environments and a leading figure in sustainable design. The study proposes an annual investment of $2 billion over the next ten years, with the long-term goal of creating a zero-emissions transportation system by 2040. Transportation needs would be met a mix of public transit, cycling, walking and private or shared electric vehicles, with shorter trips and a switch to clean fuels. To get to zero emissions, the study envisions a province of “complete communities” – in which residents do not have to travel far to meet their day-to-day needs. They can walk, bike or use public transit for most trips, and use shared electric vehicles. Complete communities have a mix of housing types (including affordable options), decent jobs, public services, parks and other public spaces, and commercial districts with restaurants, offices and retail outlets. The authors emphasize that the exact mix of transportation modes will depend on whether a community is urban, suburban or rural. 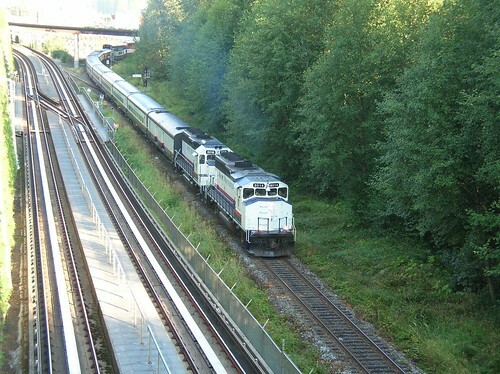 Economist Marc Lee, co-author of the study, points out that transportation of people and goods accounts for about 40% of BC’s greenhouse gas emissions. He proposes that transforming transportation is the logical next step in BC’s climate action agenda.